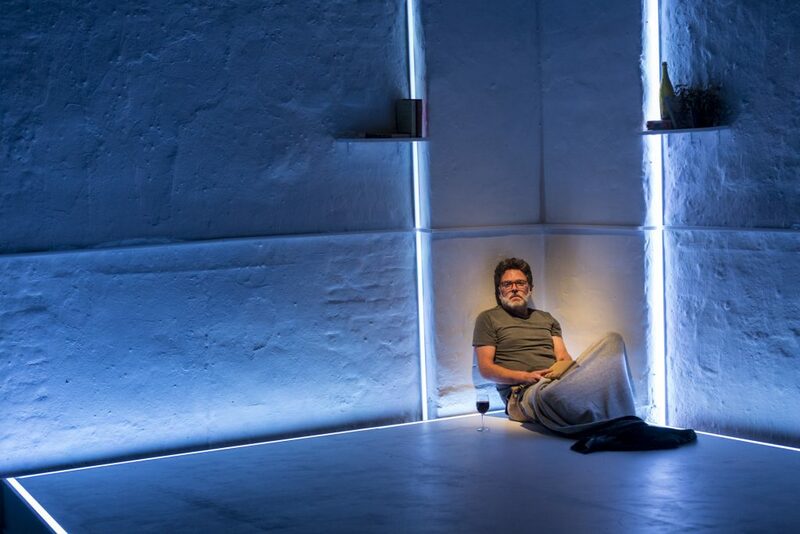 That is a lot that goes on in Mary Rachel Brown’s play and it’s mostly about what goes on internally, in the hearts and minds of its characters. Mitchell Butel’s production serves the play well and he wins good performances from his cast. Josh Quong Tart plays Gabe, the central character, a character not unfamiliar on our stages, that of the tortured artist. There’s a bit of Charles Bukowski about him. Tart gives a well layered performance. The bottle is how Gabe cops out of life. Gabe pushes people away from him, his track record with intimacy is poor, he doesn’t want to get too close. His journey is a challenging one. There’s a memorable scene where Gabe is simply slumped down in the main corner of the stage as he feels defeated by his struggle. Kate Cheel impresses as Gabe’s much younger girlfriend Matilda. She’s in love with Gabe, has a vibrant energy and wants to lift Gabe out of his cloud of gloom. She wants to understand him so that she can help him. It’s a hard task, as Gabe just wants his seclusion. Matilda wants to read Gabe’s new book and it’s only after a lot of begging that Gabe allows her to read just the first chapter. One scene defined their relationship well. Matilda has come to spend time with Gabe, is all chirpy, and wants to go out. She pleads with him to go out anywhere, somewhere, it’s so boring being home. Matilda’s youthful energy is challenging Gabe’s stuck in the mud way of being. One kind of thinks perhaps Matilda should be looking elsewhere for someone to give her love to. Lucia Mastrantone makes a strong impression as Gabe’s ex, Angela. Right from the first time we see her, she is fierce, no-nonsense, tells things as the way they are. One of these kind of characters who don’t hold back on anything. We see her catching up with Gabe and being very confrontational. She is tough talking, however inside there is still a vulnerable, weak side to her. Johnny Nasser plays Angela’s partner, Tony who has to cope with Angela’s indecisiveness. He is a strong character who is able to handle conflict and is not passive or submissive. Genevieve Blanchett’s stage design is compact and elegant. There are some very fine moments in Alexander Berlage’s lighting design. Nate Edmondson’s moody, dark soundscape hovers over the play, ‘commentating’ on the action. The ending is unexpectedly very ‘clean’, not quite in line with the jagged tone of the production. Immersive theatre, DEAD CAT BOUNCE is playing the Stables Theatre, 10 Nimrod Street, Kings Cross until 6th April, 2019. Running time is 95 minutes straight through.